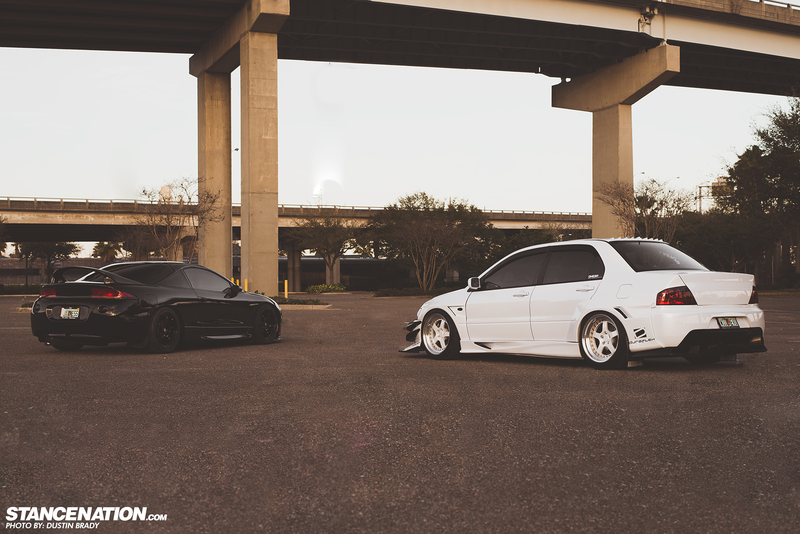 His & Hers // Justin & Jax’s Mean EVO & Eclipse. Aggression comes in many forms. While some find that it's definition lies within the realm of low-offset wheels, super slammed and "demon-cambered" cars, there will always be folks that prefer a subtle drop and the power to support their cause. You know, the individuals that take their powerhouse on wheels out to the track or road course on weekends to negotiate obstacles and throw down better times than they did last week. Or maybe they are out to give the record-holder a run for their money. Whatever the case may be, we have fun doing it. Over the years, it has been no secret that Mitsubishi/DSM is one of the most popular platforms, and it's not hard to see why. Between the simple, yet aggressive body lines and the reliable performance that is delivered from the 4G63T, they are never short of a great first impression to auto-enthusiasts. Being able to enjoy having a fun daily that is sure to turn heads is quite a heart-warming feeling. But it feels even more incredible to have a "significant-other" that is into the same exact thing and can speak the same lingo as you. One of these dynamic duos happens to be Justin and Jax Goad, owners of two of the cleanest Mitsus to come out of Jacksonville. When I first moved to Jacksonville, I knew that I would be greeted with a clean, diverse group of cars. But I wasn't prepared for what I was to stumble upon when I attended my first meet. Sitting in the end of the lot at a local meet sat Justin Goad's stunning widebody, 2003 Lancer Evolution VIII wrapped in matte-blue metallic vinyl. As I made my way over, my eyes inflated with amazement. The beautiful shaved and tucked engine bay was one to introduce itself with it's beautiful high gloss white paint, clear timing cover and several polished components. After speaking with Justin for a little while, we decided to set-up a shoot. Unfortunately, not soon after, the car was rear-ended in a parking lot. That didn't discourage him, however. Justin was ready to bring his car back and better than ever. After some time and a lot of suspense, the car was finally ready to be revealed. Justin had really outdone himself yet again. His baby was now pampered with a molded wide-body dressed with a flawless pearl-white paint job. He also added custom diffusers all around in addition to a set of stylish canards that compliment the Extreme Dimensions VT-X front bumper tremendously. To add the final touch, the car was equipped with a set of staggered 18×10.5/11? CCW LM5 with faces paint-matched to the body. While we can all agree that the visual appearance is one aspect that clearly keeps our jaws on the ground, the car has to have the handling and power to back it up. Set up with a set of Megan Racing Track coilovers, Cusco sway bars, Stoptech brakes and a graffiti-bombed 6-point Godspeed roll cage, this beast is ready to abuse every last little bit of power supplied by a Forced Performance "FP Red" turbocharger and supporting fuel modifications. By now, you've probably surrounded yourself in a pool of your own drool. "But wait! There's more!" 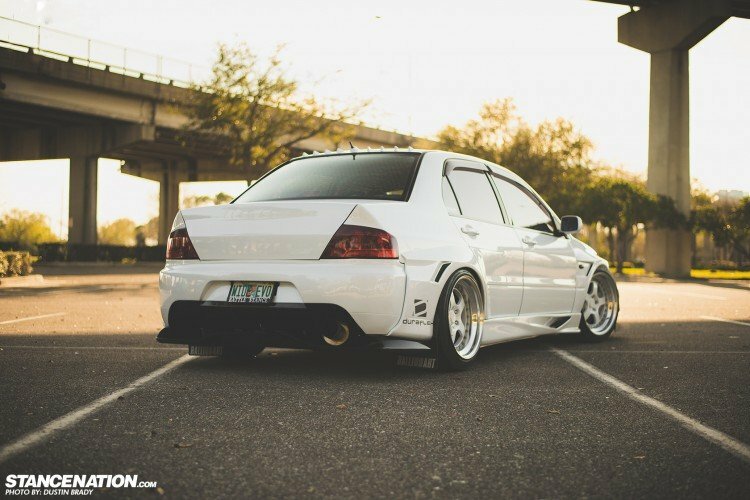 If you thought it ended with Justin's Evo 8, prepare yourself because the love of his life, Jax Goad, also owns a daily-driven monster. A vehicle that is often overlooked by people because of the production of the Evo, happens to be the Eclipse GST. But this is no ordinary Eclipse. Jax wanted to ensure that hers would easily stand out amongst others. Facing the many trials that were to come, she intended to build a reliable, yet wicked daily driver that is ready to get down in a straight line AND on a road course. She didn't only succeed in that department however. Jax opted to keep the car sleek and simple with a hint of aggression. To aid the look and functionality of the car, Jax wanted to lower it to a reasonable, but respectable height. So D2 drag coilovers were installed and put to work in addition to a couple of other goodies that keep her suspension nice and snug. We all know that it takes more than a snap of the fingers to squeeze higher power out of a 4-cylinder, especially with a stock engine. Incredibly, with the help of a billet TD05H 20G turbocharger and other bolt ons, Jax made 492whp/417tq with a completely stock bottom end and a high-flow head. Knowing that she would make high power numbers, Jax knew it would be a crucial to swap out the oem automatic transmission for a 5-speed manual to allow her to utilize that power more efficiently between each gear. Combined with a Southbend SS clutch set-up, her drivetrain was complete. I find it really hard to explain how killer these two cars are in person. You simply cannot find enough justice in words or photos. Surely most of you reading this have had that type of feeling when riding in a friend's car that just makes you think, "I want one." From the sound of the aftermarket camshafts loping at idle, to the aggressive sound of an angry turbo spooling up and ready to force ambient air into the engine, I found myself wanting to build a race-car for myself one day. But for now, I will keep my head in the clouds and hope one day I can also build something as unique and badass as these two beauties.